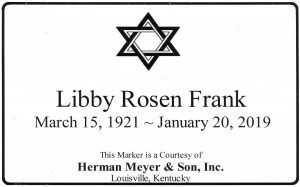 Libby Rosen Frank, 97 – Herman Meyer and Son, Inc.
Libby Rosen Frank, 97, passed away January 20, 2019 at Baptist Hospital East. She was born in Louisville and attended Louisville Girls High School. 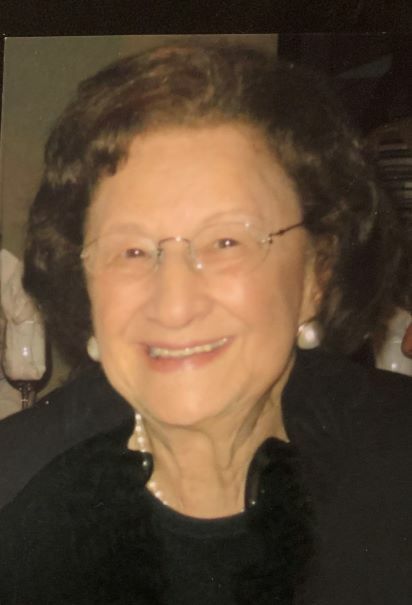 She was a member of Keneseth Israel Congregation, National Council of Jewish Women and a lifetime member of the Keneseth Israel Congregation Sisterhood. She was past president of Junior Hadassah. She was preceded in death by her husband, of 62 years, Alfred, her parents Ida and Abe Rosen and her stepfather Abraham Zimmerman. Also, her sisters, Roselyn Molin and Evelyn Loeser and her son-in-law, Harry Shapira. She is survived by her daughter, Judy Shapira; her son, Armand Frank (Paula); grandchildren, Dr. Adam Shapira (Debra), Ian Shapira (Caroline), Holly Frank (Kevin), Jonathan Frank (Lisa). Also her great-grandchildren, Lydia, Margot, Audrey and Hilary Shapira and many nieces and nephews. Funeral services will be held on Wednesday, January 23, 2019 at 2:30 p.m. at Herman Meyer & Son, Inc., 1338 Ellison Avenue. Visitation starts at 1:30 p.m. Burial to follow at Keneseth Israel Cemetery. Expressions of sympathy may be made to the Keneseth Israel Congregation Family Shabbat Fund.